Greetings, friends and former patients! I hope you had a great Memorial Day weekend and are enjoying a short work week. For most of you it's been a while since we've talked. Hopefully, that's because I'm a good PT and you've been doing your exercises! So, I want to catch you up on what's been going on. Five years ago, I partnered with a really fantastic gym and set up shop there in the West Village. Since then, the time's been filled with helping people out and having a lot of fun in the process. As our practice has grown, we were able to add some amazing Physical Therapists, start teaching more, develop new products, and incorporate a more holistic view into our role as health care providers. To recognize this evolution, last year we formed Integrated Health Sciences in order to bring you a science-based approach to health and wellness. 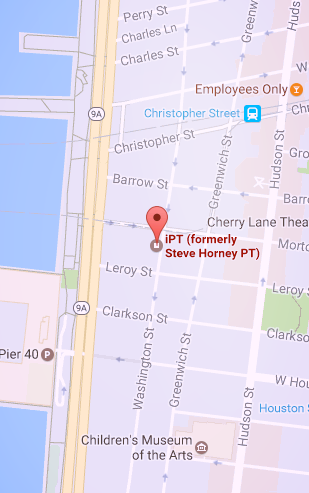 Our new approach is a collaboration of Acupuncturists, Exercise Physiologists, Medical Doctors and, of course, our treating Physical Therapists, who practice out of our clinic iPT in Gotham Gym on Morton and Washington Street. Our location in the west village! Regarding your health, there's "nice to know" and "need to know" information. So, we will be sending out "need to know" advice that we've been working on in our practice, with content ranging from sports performance to chronic pain and everything in between. If you think a friend would enjoy, feel free to forward so they can sign up here and obviously, no worries if you want to unsubscribe. In the meantime, let us know if you or anyone you know would benefit from seeing our team. We have: Fernando "Manos de ángel" Moreno, who specializes in gapping techniques for every joint and has the hands of an angel; Stephen "The Professor" Chao, who is a brilliant academic and all around nice guy who teaches at SUNY Stonybrook and moonlights with us; and Karl "Just Karl" Eichenfeldt, who is an Exercise Physiologist turned PT who can critically analyze your patterns before loosening you up and retraining your nervous system to function with less pain (grab an appointment here). As we are getting this new thing going, we have some vintage "Steve Horney PT" swag that we are looking to move. Please reply to this email with your size & mailing address and we will send you some gear (while supplies last - we have exactly 64 adult shirts and a couple of baby shirts sizes 12mo to 3T).